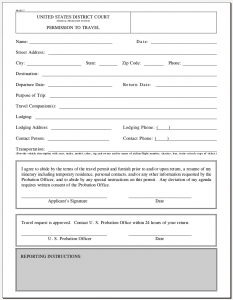 Edward Hasbrouck | Papers, Please! 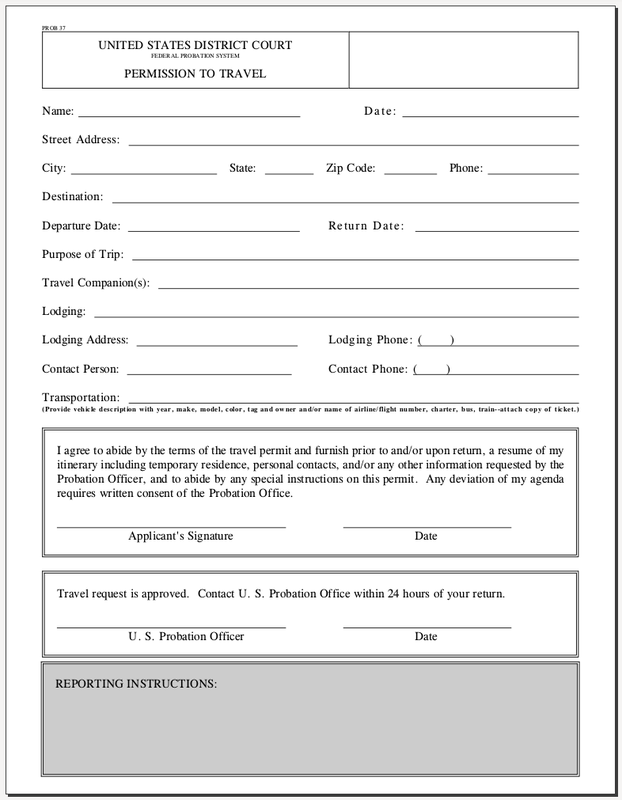 | Page 2 Edward Hasbrouck – Page 2 – Papers, Please! Is suspicionless spying on what US citizens, foreign residents, visitors to the US, and their families, friends and associates do and say on social media an “essential” function of the US government? Federal employees deemed “inessential” have been furloughed. But those still working for deferred paychecks apparently include staff of the Department of Homeland Security, including the DHS Privacy Office, responsible for promulgating rules exempting DHS surveillance from the minimal limitations imposed by the Privacy Act. In 2017, the DHS gave notice of a new system of social media and travel surveillance records, the US Customs and Border Protection (CBP) Intelligence Records System (CIRS). At the same time, the DHS proposed to exempt these records from as many as possible of the requirements of the Privacy Act. The proposed exemptions would purport to authorize the DHS to include social media and other information in the CIRS database without regard to its accuracy or relevance to any investigation or suspicion of unlawful activity, and to keep these files and any recrods of how thety are used and shared secret from the individuals to whom they pertain. Joined by eight other national civil liberties and human rights organizations, the Identity Project filed comments with the DHS in October 2017 opposing both the creation of this illegal database of records of suspicionless surveillance of activities protected by the First Amendment and the proposed Privacy act exemptions. More than a year later, on December 27, 2018 — a week after the Federal government had partially shut down, and during a holiday week when fewer people than usual would be scrutinizing the Federal Register — the DHS finalized the proposed Privacy Act exemptions for CIRS. The DHS analysis of the comments on the proposed rule completely ignored some our objections. There’s no response from the DHS to our comments on the Privacy Act’s prohibition (from which an agency cannot exempt itself) on the collection of information about how individuals exercise rights protected by the First Amendment without explicit statutory authorization, which is lacking for collection of social media data. extended periods of time that may be indicative of criminal, terrorist, or other threat. Comment: Proposed routine uses would circumvent Privacy Act safeguards and contravene legislative intent. Response: DHS’s collection of records in CIRS is intended to permit DHS/CBP to review large amounts of data in order to identify and understand relationships between individuals, entities, threats and events, and to monitor patterns of activity over extended periods of time that may be indicative of criminal, terrorist, or other threat. The CIRS database has already been in operation since at least October 2017. The Privacy Act exemptions took effect December 27, 2018, so it is no longer possible for anyone to find out what information about them is contained in CIRS, or to whom it has been disclosed. What did Amtrak think was its legal basis for requiring passengers to show ID and provide other information, and for handing this data over to DHS components and other police agencies for general law enforcement purposes? 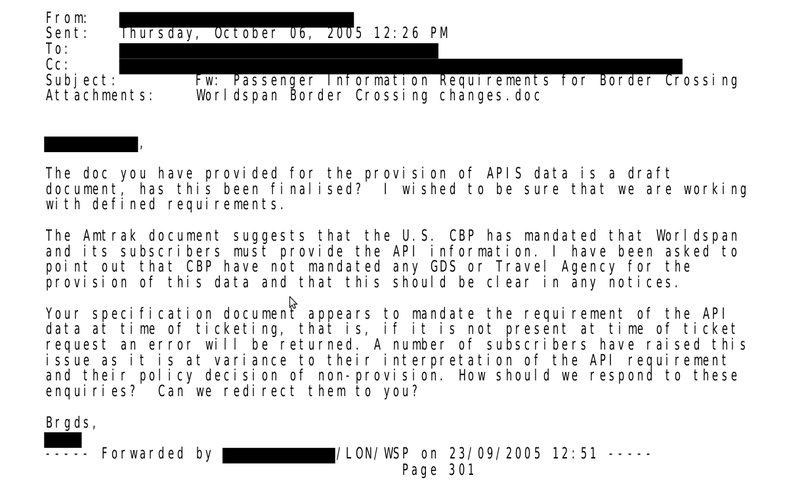 When US Customs and Border Protection (CBP) asked Amtrak to start transmitting passenger data electronically, it described this as a request for “voluntary” cooperation, noting that while the law requires airlines to collect and transmit this data to CBP, “these mandates do not currently extend to land modes of transportation” (as they still don’t today). 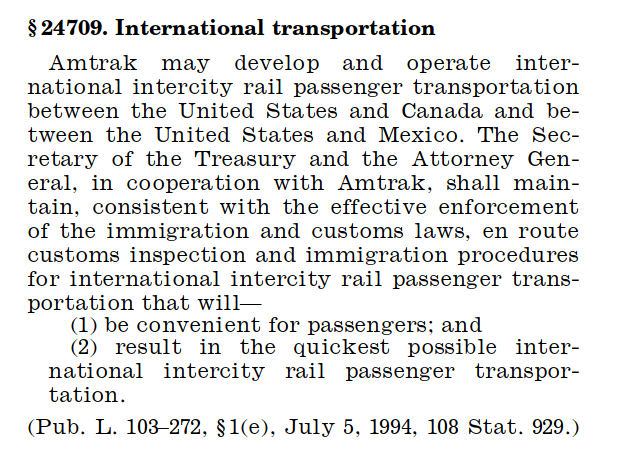 By statute, the federal government … in cooperation with Amtrak “shall maintain, consistent with the effective enforcement of immigration and customs laws, en route customs inspections and immigration procedures for international intercity rail passenger transportation that will (1) be convenient for passenger; and (2) result in the quickest possible international rail passenger transportation.” 49 USC 24709. In other words,someone at Amtrak thinks it’s not merely permitted but required by this provision of Federal law to implement whatever level of intrusiveness of data collection and data sharing will make international trains run more quickly. 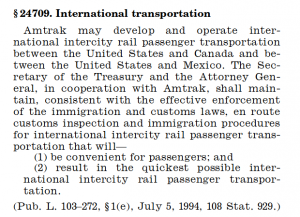 It’s arguable, to say the least, whether Congress intended this law as a mandate for ID credentials or data collection, whether collection of passenger data prior to ticketing actually expedites international trains (compared to, as used to happen, conducting customs and immigration inspections onboard while trains are in motion), or whether demands for ID and passenger information are consistent with the clause of this section requiring that measures taken be “convenient for passengers”. But someone at Amtrak seems to have interpreted this statute as such a mandate, and represented it as such to other Amtrak staff and contractors. Are there any limits to what information or actions Amtrak would think is required of passengers on international trains, if that would keep US and Canadian border guards from stopping or delaying trains at the border for customs inspection? 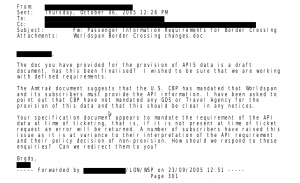 There’s no indication in the documents we received as to whether this Worldspan subscriber, or any other travel agency, was given any answer to this question. As part of Amtrak’s response to a separate FOIA request, however, we’ve received a redacted copy of Amtrak’s internal directive to staff regarding passenger ID requirements. According to this document, Amtrak stopped requiring passengers to show ID in order to buy tickets as of October 25, 2017. But no records related to this change, or the reasons for it, were released in response to our request. Amtrak train crews are supposed to check ID of a randomly selected 10% or 20% of passengers. In our experience, however, Amtrak staff rarely require any passengers to show ID. Although Amtrak is a Federal government entity, Amtrak’s of list of acceptable ID is much more inclusive than the list of ID that comply with the REAL-ID Act. Amtrak’s list of ID acceptable for train travel includes, among other acceptable credentials, any ID issued by a public or private middle school, high school, college, or university, and drivers’ licensed issued by US states and territories to otherwise undocumented residents. Amtrak even accepts a “California state issued medical marijuana card“, which doesn’t have the cardholder’s name, only their photo. We’ll leave it as an exercise to our readers to figure out what relationship Amtrak thinks there is between being being eligible for medical cannabis and being eligible for Amtrak train travel. The most reasonable inference is that someone at Amtrak has decided that Amtrak should make a show of requiring ID, but that others at Amtrak don’t really want to turn away travelers without ID. Perhaps they recognize that travellers who don’t have or don’t want to show ID are a valuable Amtrak customer demographic. Who’s paying for the national ID database? 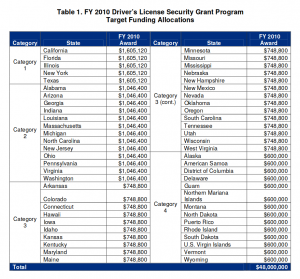 As part of a flurry of overdue year-end responses to our Freedom Of Information Act (FOIA) requests, we’ve gotten some curious messages about Federal government funding for SPEXS, the national database of drivers’ license and state ID-card data being created — with no apparent consideration of its impact on privacy and civil liberties — to enable states to comply with the Federal REAL-ID Act of 2005. 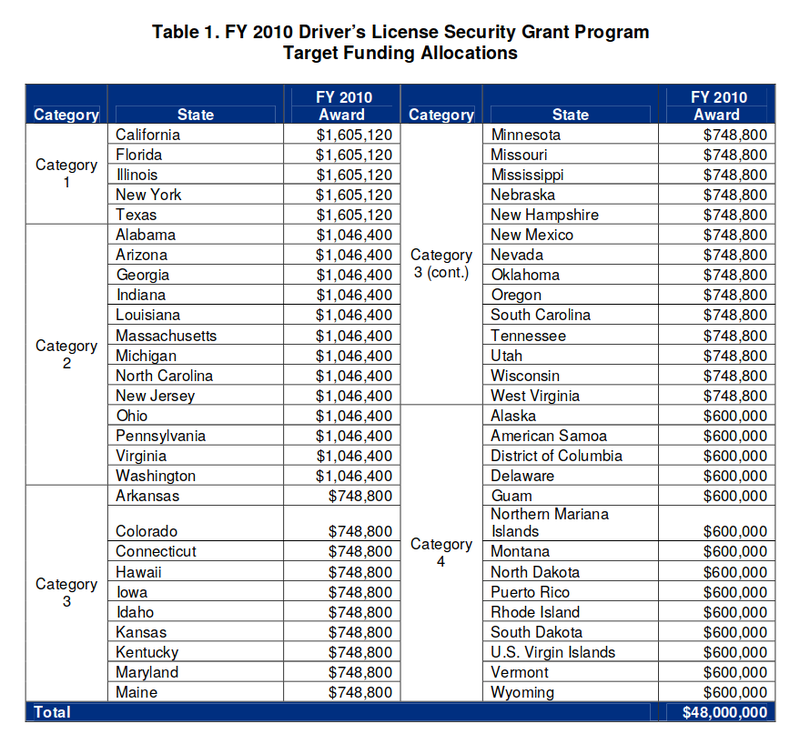 The DHS continues to claim that SPEXS isn’t a Federal database: “REAL ID does not create a federal database of driver license information.” But we know that much of the funding for the SPEXS database and the “State-To-State” (S2S) system of which it is a component has come from Federal grants laundered through grants to states and then reassembled by the American Association of Motor Vehicle Administrators (AAMVA) to pay the contractors building and operating the database and network. The Identity Project and our parent organization, the First Amendment Project, have moved to a new office in Preservation Park in downtown Oakland (map). Most of the time we work remotely, so it’s better to contact us by email, phone, or Signal than by snail-mail. Do you need ID to get OFF a plane? We’ve reported on several legal challenges to demands for ID as a condition of boarding airline flights. But what about demands for ID after such a flight, as a condition of disembarking or leaving the airport at your destination? Is such a demand legal? Must you comply? 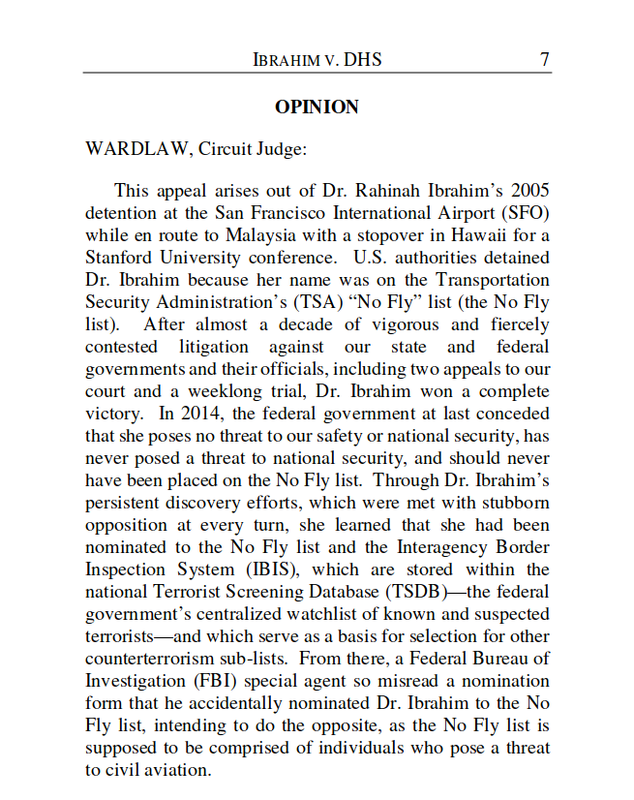 The first court case we are aware of to raise this issue began when DHS law enforcement officers from US Customs and Border Protection (CBP) blocked the only exit from a Delta Airlines plane when it arrived at its gate at JFK Airport in February 2017 after a flight from San Francisco, and required passengers to show ID before they were allowed to leave the plane. Several passengers, represented by the ACLU, sued the DHS, the CBP and the responsible officials, supervisors, and front-officers in Federal court for the Eastern District of New York, which covers Brooklyn, Queens (where JFK Airport is located) and Long Island. The plaintiffs in the lawsuit, originally Amadei v. Duke and now Amadei v. Neilsen, complain that the demand for ID violated their 4th Amendment right to be free from unreasonable searches and seizures. They also complain that the DHS policy or practice of demanding ID from some passengers disembarking from domestic airline flights was adopted without complying with the due process requirements of the Administrative Procedure Act (APA). The first significant — although far from final — ruling in the case came on December 13, 2018. The District Court rejected government motions to dismiss the complaint. Judge Nicholas Garaufis found that the passengers had raised sufficiently credible allegations of violations of the 4th Amendment and the APA to entitle them to their day in court.